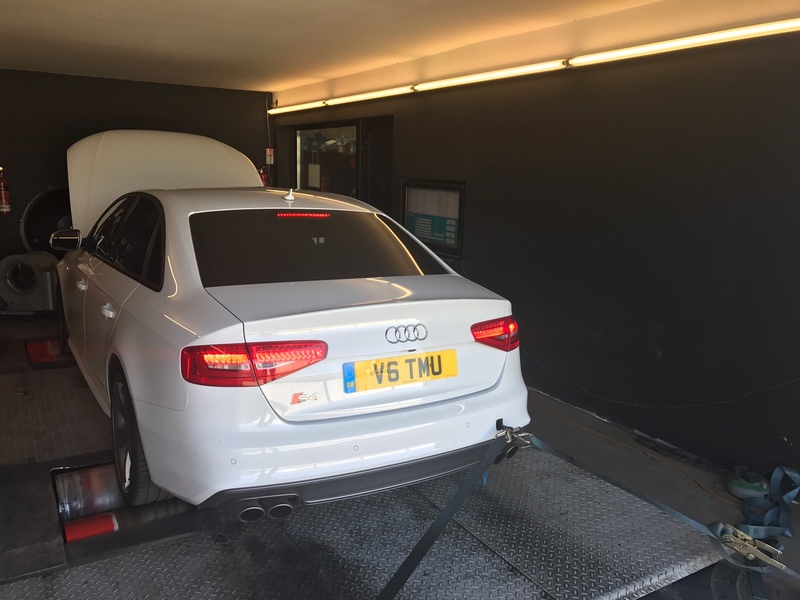 Hi guys, just wanted to share my experience of my B8.5 S4, which went in for MRC for Stage 2 along with the DSG remap. Massive thanks to Doug and guys at MRC for all their effort - I had heard a lot about them before my visit and tbh, it didn't disappoint. And I am sure like many of us here I can't recommend them highly enough. Legends! The car is just Stage 2, which incudes DSG tune as well. I wanted to change the Exhaust at the the same time but it looks like it will be sometime over the next few next months as I can't decide between Milltek Non-Res vs Valvesonic v Scorpion. Scorpion was the latest addition to the "wish list" after meeting @jaygemson who was also there for a health check on his B8 S4 and had the said exhaust fitted to his car. The car was rapid before but my God the tune changes it to a completely different beast. Joining M40 from the Banbury exist, I have never been excited by any car before, not that I have an exciting car history but it was a completely different experience. The car pulls and pulls and there is no stopping to it ... I believe it would take me a few weeks getting used to of the added power as although I hate to admit it, it needs getting used to. 45bvtc, Derzal, J305 and 6 others like this. "Just" stage 2. Haha... Nice! q5man and Tashfeen like this. Chop. and Tashfeen like this. Chop. and xpoweruk like this. Tashfeen and xpoweruk like this. @Dippy, I would love to see if I could hit 490 (+/- 5). You guys are the experts do you think I'd be able to see any gains. I Jason there (don't remember his full name) who was there for little tweaks and his final numbers were impressive; 493. I'd love to get to 490 to be honest . q5man, pez81, THQuattro and 2 others like this. Build http://www.audi-sport.net/xf/threads/chops-s4-thread.252812/ "Team Chav 2016"
45bvtc and Tashfeen like this. 45bvtc, xpoweruk and Chop. like this. Now in a Sprint Blue B8 S4, Airlift 3p Suspension, Veeman V-FS29R Wheels, ECS Kohlefaser Luft-Technik Intake, Carbon Engine Covers, Carbon Strut Brace, Carbon Front Splitter, Non-Res Milltek, DTUK FSR+ Tuning Box, Driving Performance Rear Diffuser. more coming soon. Tashfeen and Chop. like this. S3 TAM, Carlos85, 8BallAddict and 4 others like this. It also runs a even larger than stage2 pulley and additional custom mapping which prob made more difference than the exhaust! We've dyno's two identical Stage2 cars on the same day at MRC one of which had decat test pipes and one which didn't and there was only 1hp difference. MRC told me not to bother with an aftermarket exhaust because the stock one is not restrictive. That's fine for me as I don't want my car to be any noisier. But I remain sceptical that the OEM system has NO restrictions, so it'd be great to see what you get. But as long as you're happy with the improved sound then you shouldn't be too disappointed if the gain is only slight. IIRC Doug's car originally made about 500PS with the high ratio pulley and bigger charge cooler. So maybe there is the potential for up to 20PS from the exhaust, but only at the highest ratio. I'm more interested in the other end of the airflow - waiting to see some results with APR's "supercharger". It is a shame B8.5s are slightly restrictive than B8s. 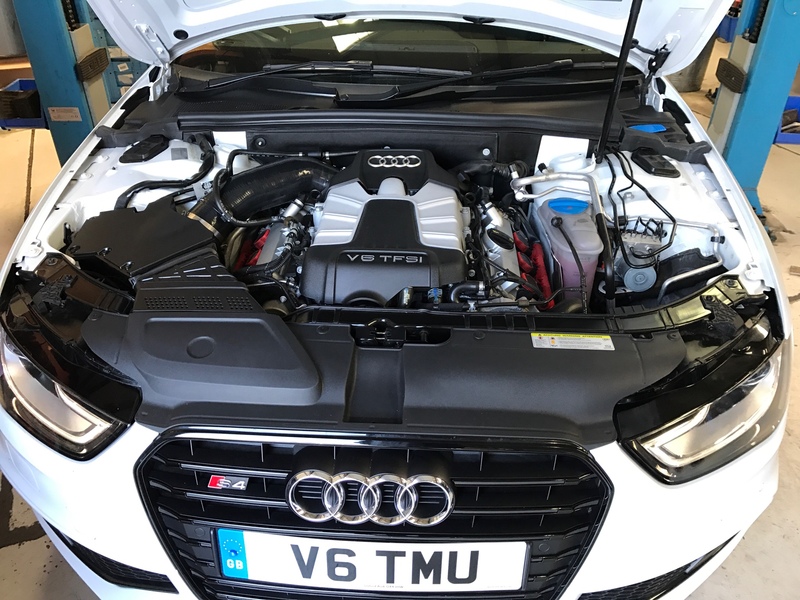 A standard Stage 2 on a B8 gives you slightly higher gains compared to that of a B8. Re: APR Ultracharger, what their website suggests are significant gains 143hp/143tq and 540hp at the crank and that too with 104 race fuel. However (and this is my view) with the number of other modifications one has to make is it actually worth it. On 91RON it only gives you 478, which MRC give you anyway. Hahaa I wish,but my skills aint as fast as a DSG lol. The 93 AKI ultracharger produces 498 HP. I think you'd need to be pretty well off or want the pub bragging rights to buy new charge cooler, ultra charger and potentially bigger pulley (and have it all fitted & fettled) for 20 or so HP. I hope you guys that are changing your exhausts are removing the Catted downpipes as well before remapping? I think once you start knocking on the door of 500+hp then a cooler upgrade is a must and the standard cats days are numbered which will need them either replacing or removing and the map tweaking to suit. Do you know of any HFCs for the S4/S5? These figures of 498hp are only made with Stage2+ inc dual pulley & the Ultracharger V's MRC's stage2 480hp with just the larger crank pulley. agreed its a lot of extra money for 20 or so HP......is it really worth it? TBF to the Ultra charger the power under the curve will be quite different to stage 2,but IMO the Ultra isn't worth it. I assume that it should have been a "B8.5" at the end of that sentence? However I don't believe you are correct there. Once you have the DL501 remapped (because the redline for the B8.5 is lower than the B8) I think you'll find that allowing for variations engine to engine (and other factors unique to each car or the day of the test), MRC's stage 2 is pretty much the same between B8 and B8.5 cars. xpoweruk and Tashfeen like this. It depends what you are after though as it isn't all about horsepower. As far as I can tell, the supercharger upgrades (i.e. the airflow mods) do more for torque lower down than peak power. That's more useful in day-to-day driving. APR's site recommends that the OE cats need to be removed at this power level, probably for good reason. Cooling and dual pulley is all you need to get that sort of power,obviously a map to go with too. The US cars seem to have issues with failing cats on stock & tuned cars.Not something i have heard about in the UK. Maybe our fuel is more consistent,maybe our climate being cooler helps ?? Since I bought the car this forum has helped a lot in learning about the car. You all are legends; treasure trove of knowledge for novices like me. Dippy's S5 and XP's B8 build posts have been very helpful in learning about the platform and what it is capable of. I know what it says in the box. It isn't clear with which fuel that is with though - as 91 AKI is producing 478 bhp, which is where we are on MRC tuning levels. I know of two cars belonging to friends that have had cats fail, probably due to the extra heat generated when tuned. The last one on 90k the cat literally broke up and blocked the downpipe hence why testpipes were fitted and the car returned to MRC for a map tweak. You've not heard of cats failing on UK tuned cars? Speak to Doug @ MRC they've changed loads of these cat as they are prone to failure.